Though smallpox was eradicated from the planet two decades ago, recent terrorist acts have raised the horrific possibility that rogue states, laboratories, or terrorist groups are in possession of secret stockpiles of the virus that causes the disease, and may be preparing to unleash it on target populations. Because it is a far deadlier killer than other biological warfare agents such as anthrax, and because the universal vaccination against smallpox was halted decades ago, a smallpox attack today would be nothing short of catastrophic. This clear, authoritative study looks at the long and fascinating history of the virus, with an informative overview of the political, biological, environmental, medical, and legal issues surrounding the question of whether or not the virus should be exterminated. The only two known samples of the virus are currently stored in Atlanta and Russia. The World Health Organization has repeatedly scheduled their destruction—an action that would rid the planet of all publicly acknowledged smallpox strains forever. Opponents of this plan argue that by destroying these last samples we are denying the possibility that this unique virus could be turned to beneficial purposes in basic scientific research. Others see the stockpile as part of a deterrent against future germ attacks. Proponents of prompt eradication argue that scientists have already learned all they can from this particular virus, and that by destroying the stockpile we are preventing it from ever falling into the wrong hands. As a thirty-year veteran of arms control issues, David Koplow is uniquely suited to provide readers with an informed and well-considered understanding of the complexities involved in the handling of this deadly virus. David Koplow is Professor of Law at Georgetown University. From 1997 to 1999 he served as Deputy General Counsel for International Affairs at the U.S. Department of Defense, where he was the Pentagon's senior legal advisor on biological warfare issues, including smallpox. He has published extensively on arms control and national security matters, and is the author of By Fire and Ice: Dismantling Chemical Weapons While Preserving the Environment (1997) and Testing a Nuclear Test Ban (1996). 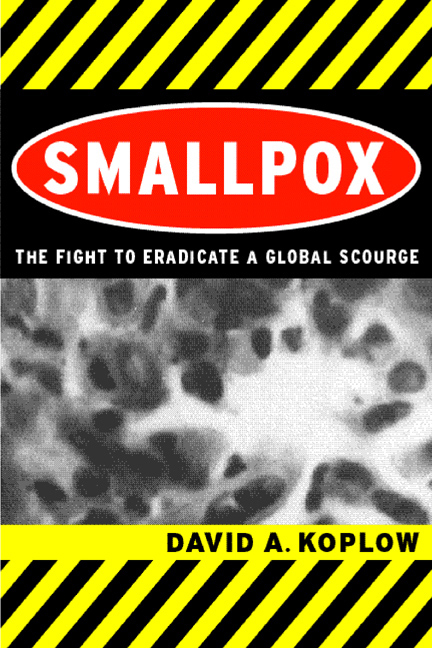 "David Koplow's book is an important work on a crucial subject. The author brings together an extraordinary amount of information on a vital policy issue. There is nothing available that treats the issue of smallpox with any comparable degree of completeness. Koplow marshals sources from myriad disciplines in a coherent, well-rounded discussion providing a service to the casual as well as the sophisticated reader. This book is a one-stop reference, containing virtually all the information an analyst needs to know. "—Barry Kellman, Director of the International Weapons Control Center, DePaul University College of Law.